Dethe is a geek dad, aesthetic programmer, mentor, and creator of the Waterbear visual programming tool. He co-hosts the Vancouver Maker Education Salons and wants to fill the world with robotic origami rabbits. In block-based programming languages, you write programs by dragging and connecting blocks that represent parts of the program. Block-based languages differ from conventional programming languages, in which you type words and symbols. Learning a programming language can be difficult because they are extremely sensitive to even the slightest of typos. Most programming languages are case-sensitive, have obscure syntax, and will refuse to run if you get so much as a semicolon in the wrong place—or worse, leave one out. Further, most programming languages in use today are based on English and their syntax cannot be localized. In contrast, a well-done block language can eliminate syntax errors completely. You can still create a program which does the wrong thing, but you cannot create one with the wrong syntax: the blocks just won't fit that way. Block languages are more discoverable: you can see all the constructs and libraries of the language right in the list of blocks. Further, blocks can be localized into any human language without changing the meaning of the programming language. Block-based languages have a long history, with some of the prominent ones being Lego Mindstorms, Alice3D, StarLogo, and especially Scratch. 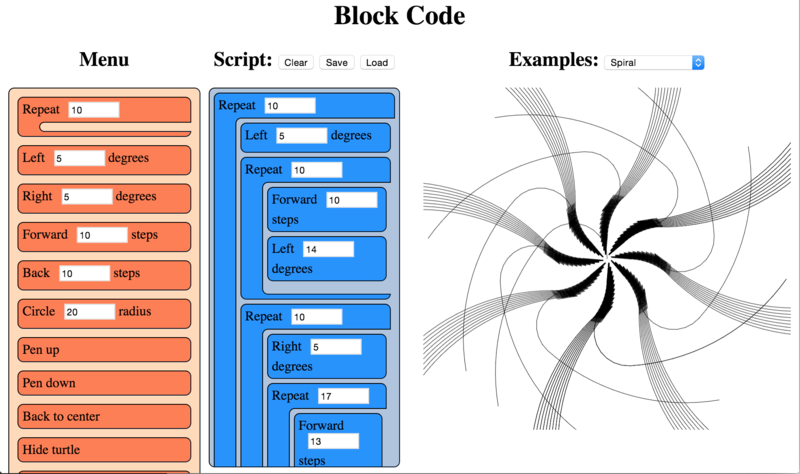 There are several tools for block-based programming on the web as well: Blockly, AppInventor, Tynker, and many more. The choice of turtle graphics for this language goes back to the Logo language, which was created specifically to teach programming to children. Several of the block-based languages above include turtle graphics, and it is a small enough domain to be able to capture in a tightly constrained project such as this. If you would like to get a feel for what a block-based-language is like, you can experiment with the program that is built in this chapter from author's GitHub repository. To do this, we encapsulate everything that is specific to the turtle language into one file (turtle.js) that we can easily swap with another file. Nothing else should be specific to the turtle language; the rest should just be about handling the blocks (blocks.js and menu.js) or be generally useful web utilities (util.js, drag.js, file.js). That is the goal, although to maintain the small size of the project, some of those utilities are less general-purpose and more specific to their use with the blocks. One thing that struck me when writing a block language was that the language is its own IDE. You can't just code up blocks in your favourite text editor; the IDE has to be designed and developed in parallel with the block language. This has some pros and cons. On the plus side, everyone will use a consistent environment and there is no room for religious wars about what editor to use. On the downside, it can be a huge distraction from building the block language itself. Modern web browsers are powerful platforms, with a rich set of tools for building great apps. If something about the implementation became too complex, I took that as a sign that I wasn't doing it "the web way" and, where possible, tried to re-think how to better use the browser tools. An important difference between web applications and traditional desktop or server applications is the lack of a main() or other entry point. There is no explicit run loop because that is already built into the browser and implicit on every web page. All our code will be parsed and executed on load, at which point we can register for events we are interested in for interacting with the user. After the first run, all further interaction with our code will be through callbacks we set up and register, whether we register those for events (like mouse movement), timeouts (fired with the periodicity we specify), or frame handlers (called for each screen redraw, generally 60 frames per second). The browser does not expose full-featured threads either (only shared-nothing web workers). block.js is the abstract representation of a block-based language. drag.js implements the key interaction of the language: allowing the user to drag blocks from a list of available blocks (the "menu") to assemble them into a program (the "script"). menu.js has some helper code and is also responsible for actually running the user's program. turtle.js defines the specifics of our block language (turtle graphics) and initializes its specific blocks. This is the file that would be replaced in order to create a different block language. Blocks have two optional bits of structure. They can have a single numeric parameter (with a default value), and they can be a container for other blocks. These are hard limits to work with, but would be relaxed in a larger system. In Waterbear there are also expression blocks which can be passed in as parameters; multiple parameters of a variety of types are supported. Here in the land of tight constraints we'll see what we can do with just one type of parameter. It's important to note that there is no real distinction between blocks in the menu and blocks in the script. Dragging treats them slightly differently based on where they are being dragged from, and when we run a script it only looks at the blocks in the script area, but they are fundamentally the same structures, which means we can clone the blocks when dragging from the menu into the script. The createBlock(name, value, contents) function returns a block as a DOM element populated with all internal elements, ready to insert into the document. This can be used to create blocks for the menu, or for restoring script blocks saved in files or localStorage. While it is flexible this way, it is built specifically for the Blockcode "language" and makes assumptions about it, so if there is a value it assumes the value represents a numeric argument and creates an input of type "number". Since this is a limitation of the Blockcode, this is fine, but if we were to extend the blocks to support other types of arguments, or more than one argument, the code would have to change. The purpose of drag.js is to turn static blocks of HTML into a dynamic programming language by implementing interactions between the menu section of the view and the script section. The user builds their program by dragging blocks from the menu into the script, and the system runs the blocks in the script area. We define some variables at the top of the file. When we're dragging, we'll need to reference these from different stages of the dragging callback dance. var dragType = null; // Are we dragging from the menu or from the script? If dragging from script to menu, delete dragTarget (remove block from script). If dragging from script to script, move dragTarget (move an existing script block). If dragging from menu to script, copy dragTarget (insert new block in script). If dragging from menu to menu, do nothing. During the dragStart(evt) handler we start tracking whether the block is being copied from the menu or moved from (or within) the script. We also grab a list of all the blocks in the script which are not being dragged, to use later. The evt.dataTransfer.setData call is used for dragging between the browser and other applications (or the desktop), which we're not using, but have to call anyway to work around a bug. While we are dragging, the dragenter, dragover, and dragout events give us opportunities to add visual cues by highlighting valid drop targets, etc. Of these, we only make use of dragover. // Necessary. Allows us to drop. When we release the mouse, we get a drop event. This is where the magic happens. We have to check where we dragged from (set back in dragStart) and where we have dragged to. Then we either copy the block, move the block, or delete the block as needed. We fire off some custom events using trigger() (defined in util.js) for our own use in the block logic, so we can refresh the script when it changes. // stops the browser from redirecting. The dragEnd(evt) is called when we mouse up, but after we handle the drop event. This is where we can clean up, remove classes from elements, and reset things for the next drag. The file menu.js is where blocks are associated with the functions that are called when they run, and contains the code for actually running the script as the user builds it up. Every time the script is modified, it is re-run automatically. "Menu" in this context is not a drop-down (or pop-up) menu, like in most applications, but is the list of blocks you can choose for your script. This file sets that up, and starts the menu off with a looping block that is generally useful (and thus not part of the turtle language itself). This is kind of an odds-and-ends file, for things that may not fit anywhere else. Having a single file to gather random functions in is useful, especially when an architecture is under development. My theory of keeping a clean house is to have designated places for clutter, and that applies to building a program architecture too. One file or module becomes the catch-all for things that don't have a clear place to fit in yet. As this file grows it is important to watch for emerging patterns: several related functions can be spun off into a separate module (or joined together into a more general function). You don't want the catch-all to grow indefinitely, but only to be a temporary holding place until you figure out the right way to organize the code. We keep around references to menu and script because we use them a lot; no point hunting through the DOM for them over and over. We'll also use scriptRegistry, where we store the scripts of blocks in the menu. We use a very simple name-to-script mapping which does not support either multiple menu blocks with the same name or renaming blocks. A more complex scripting environment would need something more robust. We use scriptDirty to keep track of whether the script has been modified since the last time it was run, so we don't keep trying to run it constantly. When we want to notify the system to run the script during the next frame handler, we call runSoon() which sets the scriptDirty flag to true. The system calls run() on every frame, but returns immediately unless scriptDirty is set. When scriptDirty is set, it runs all the script blocks, and also triggers events to let the specific language handle any tasks it needs before and after the script is run. This decouples the blocks-as-toolkit from the turtle language to make the blocks re-usable (or the language pluggable, depending how you look at it). As part of running the script, we iterate over each block, calling runEach(evt) on it, which sets a class on the block, then finds and executes its associated function. If we slow things down, you should be able to watch the code execute as each block highlights to show when it is running. The requestAnimationFrame method below is provided by the browser for animation. It takes a function which will be called for the next frame to be rendered by the browser (at 60 frames per second) after the call is made. How many frames we actually get depends on how fast we can get work done in that call. We add blocks to the menu using menuItem(name, fn, value, contents) which takes a normal block, associates it with a function, and puts in the menu column. We define repeat(block) here, outside of the turtle language, because it is generally useful in different languages. If we had blocks for conditionals and reading and writing variables they could also go here, or into a separate trans-language module, but right now we only have one of these general-purpose blocks defined. turtle.js is the implementation of the turtle block language. It exposes no functions to the rest of the code, so nothing else can depend on it. This way we can swap out the one file to create a new block language and know nothing in the core will break. Turtle programming is a style of graphics programming, first popularized by Logo, where you have an imaginary turtle carrying a pen walking on the screen. 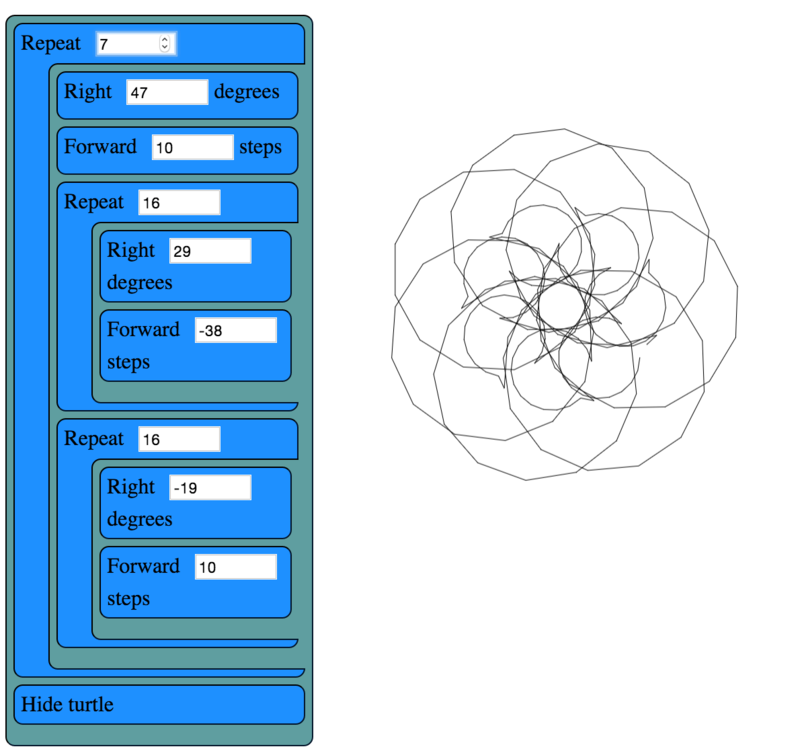 You can tell the turtle to pick up the pen (stop drawing, but still move), put the pen down (leaving a line everywhere it goes), move forward a number of steps, or turn a number of degrees. Just those commands, combined with looping, can create amazingly intricate images. In this version of turtle graphics we have a few extra blocks. Technically we don't need both turn right and turn left because you can have one and get the other with negative numbers. Likewise move back can be done with move forward and negative numbers. In this case it felt more balanced to have both. The image above was formed by putting two loops inside another loop and adding a move forward and turn right to each loop, then playing with the parameters interactively until I liked the image that resulted. The reset() function clears all the state variables to their defaults. If we were to support multiple turtles, these variables would be encapsulated in an object. We also have a utility, deg2rad(deg), because we work in degrees in the UI, but we draw in radians. Finally, drawTurtle() draws the turtle itself. The default turtle is simply a triangle, but you could override this to draw a more aesthetically-pleasing turtle. Note that drawTurtle uses the same primitive operations that we define to implement the turtle drawing. Sometimes you don't want to reuse code at different abstraction layers, but when the meaning is clear it can be a big win for code size and performance. direction = deg2rad(90); // facing "up"
We have a special block to draw a circle with a given radius at the current mouse position. We special-case drawCircle because, while you can certainly draw a circle by repeating MOVE 1 RIGHT 1 360 times, controlling the size of the circle is very difficult that way. Our main primitive is moveForward, which has to handle some elementary trigonometry and check whether the pen is up or down. Most of the rest of the turtle commands can be easily defined in terms of what we've built above. When we want a fresh slate, the clear function restores everything back to where we started. When this script first loads and runs, we use our reset and clear to initialize everything and draw the turtle. Now we can use the functions above, with the Menu.item function from menu.js, to make blocks for the user to build scripts from. These are dragged into place to make the user's programs. Building a small, tightly scoped version of the larger system I work on has been an interesting exercise. Sometimes in a large system there are things you are hesitant to change because they affect too many other things. In a tiny, toy version you can experiment freely and learn things which you can then take back to the larger system. For me, the larger system is Waterbear and this project has had a huge impact on the way Waterbear is structured. "live coding" where the results are shown whenever you change the block script. The thing about experiments is that they do not have to succeed. We tend to gloss over failures and dead ends in our work, where failures are punished instead of treated as important vehicles for learning, but failures are essential if you are going to push forward. While I did get the HTML5 drag-and-drop working, the fact that it isn't supported at all on any mobile browser means it is a non-starter for Waterbear. Separating the code out and running code by iterating through the blocks worked so well that I've already begun bringing those ideas to Waterbear, with excellent improvements in testing and debugging. The simplified hit testing, with some modifications, is also coming back to Waterbear, as are the tiny vector and sprite libraries. Live coding hasn't made it to Waterbear yet, but once the current round of changes stabilizes I may introduce it. What Are We Trying to Build, Really? Building a small version of a bigger system puts a sharp focus on what the important parts really are. Are there bits left in for historical reasons that serve no purpose (or worse, distract from the purpose)? Are there features no-one uses but you have to pay to maintain? Could the user interface be streamlined? All these are great questions to ask while making a tiny version. Drastic changes, like re-organizing the layout, can be made without worrying about the ramifications cascading through a more complex system, and can even guide refactoring the complex system. There are things I wasn't able to experiment with in the scope of this project that I may use the blockcode codebase to test out in the future. It would be interesting to create "function" blocks which create new blocks out of existing blocks. Implementing undo/redo would be simpler in a constrained environment. Making blocks accept multiple arguments without radically expanding the complexity would be useful. And finding various ways to share block scripts online would bring the webbiness of the tool full circle.